I’ve watched enough programmes with Kirstie and Phil to know it’s all about Location Location Location. 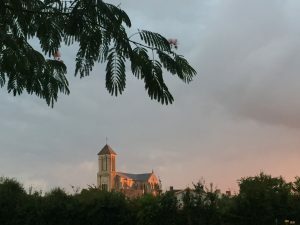 Situated in a pretty village, with a church that dominates the skyline, not to mention an encroyable Boulangerie, it’s one of the main reasons I fell in love with Chateau La Foret. The village of Saint Julien des Landes and its surroundings offers walking and cycling routes that take in traditional French Madeleine style houses, rustic farm buildings and sunflower fields, as well as the more modern architecture. 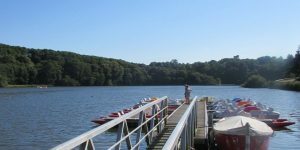 Only 5km up the road, ideal for cycling, including for little ones, is Lac Jaunay; a peaceful haven with pedalos, canoes, children’s play area, and traditional Lakeside Auberge. Walking and cycling trails run in the woods that surround the lake, and it provides the perfect backdrop for twitchers and botanists. 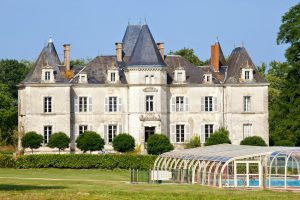 Chateau La Foret is also perfectly placed to explore the coastline of the Vendee, with the golden sands of Bretignolles- sur- Mer only a 15 minute drive. 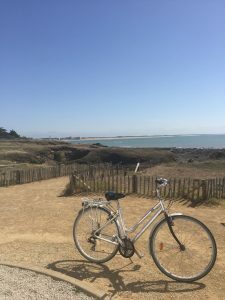 The larger towns of Saint Gilles Croix de Vie and Les Sables d’ Olonne not only offer a Grande Plage, but shops, restaurants and Edwardian architecture, and are situated a 20 minute drive away. 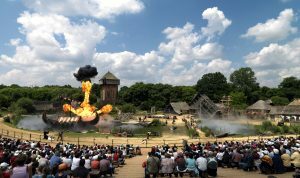 If you prefer to explore further afield, the A87 motorway is only a 10 minute drive, with most of the main attractions no more than a 60 minute journey, including the must visit island of Noirmoutier, the historic harbour town, La Rochelle, the regions capital, Nantes, as well as the award winning Puy du Fou. The location of the parc is ideal if you want to go out and explore the region, but return to a haven of fairytale sleepiness.